Sometimes questions from readers make for interesting research and articles. I hope that you find that this article is such a case. Please keep the questions coming! Email me at the email address that appears at the end of this article. What’s the Deal With; The Genesis of the “Horse-Wheel” Emblems? The purpose and scope of this article is to address the genesis of the now familiar “wheel horse” and “wheel arrow” emblems. 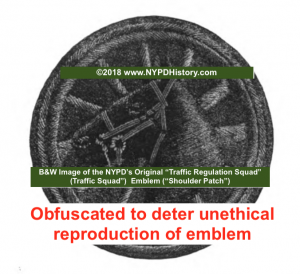 These “shoulder patches” are now seen throughout the country, and perhaps beyond, on the uniforms and vehicles worn and used by police, and in New York City, civilian traffic officers. 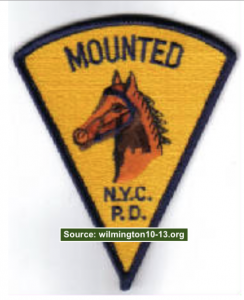 Great pride is taken by the traffic, “mounted” (horse) and “wheel” (motorcycle and bicycle) officers in their assignments and the emblems that signify their selection for these special assignments. But where did these emblems first appear on the uniforms of police officers? 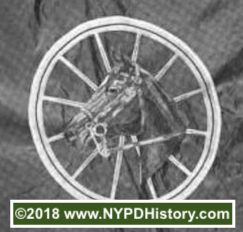 Until, and if, corrected, it is believed that it was the Police Department of the City of New York (PDNY) that first introduced the “wheel horse” emblem which was later the inspiration for the “wheel arrow” emblem. Prior to 1900, there were practically no codified rules or laws regulating the movement of traffic. In the first decade of the new millennium, automobile traffic increased exponentially. New methods to control the direction, flow, and speed of traffic were required. 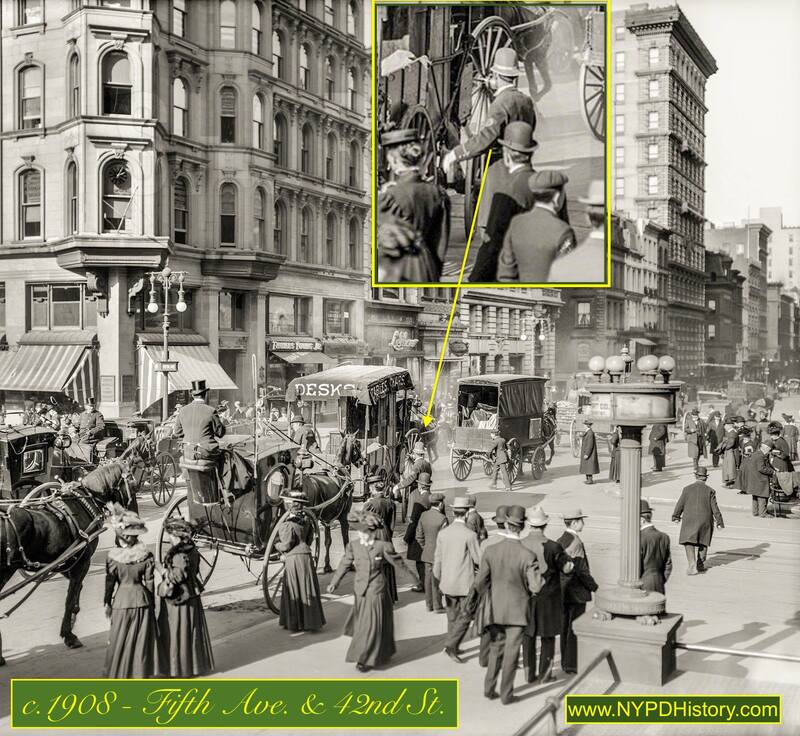 Officers dealt with a wide and dizzying array of moving objects including: pedestrians, bicyclists, persons on horseback, horse-drawn wagons and carriages, steam and “gasolene-powered” automobiles, motorcycles, trolley cars, omnibuses, etc. 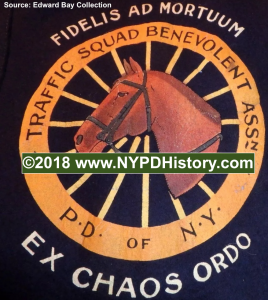 The order directed the officers to wear on their left sleeves, half-way between their shoulder and elbow, an embroidered cloth emblem consisting of a yellow-colored wheel with a brown-colored horse’s head. 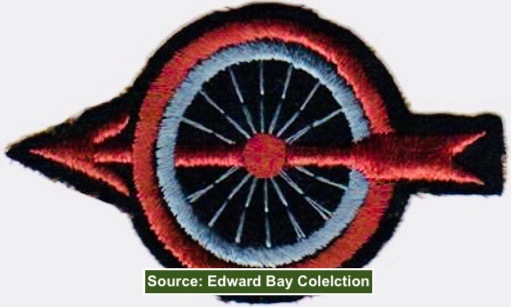 Officers were required to purchase the emblems at a cost of sixty-five cents per emblem. The city contracted with a well-known local company to manufacture the emblems, white caps, and much of the other uniform items worn by its police officers. The Traffic Regulation Squad’s Mounted officers wore white caps, as opposed to helmets, and the new emblems on the occasion of the Annual Police Parade held on May 6, 1905. 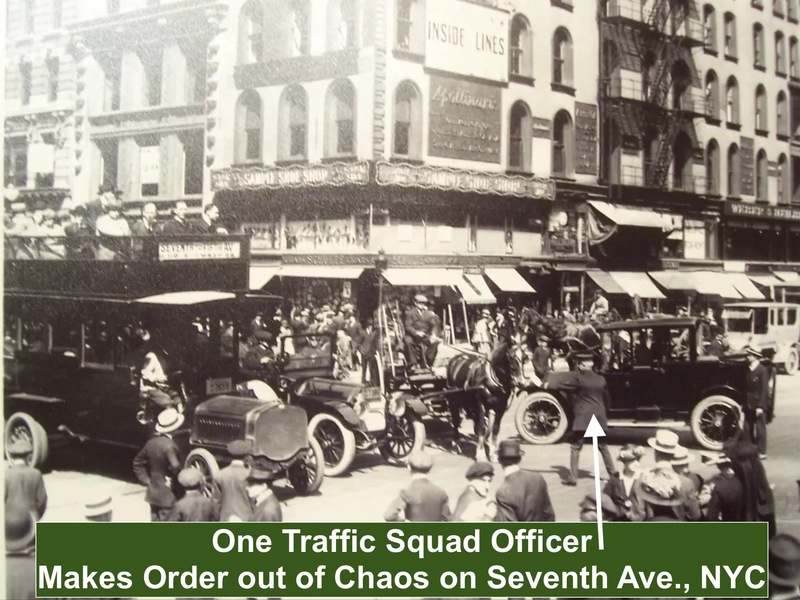 By 1905, the term “Traffic Squad” appeared more frequently in the available records of the department. The work of the Traffic Squad was immediately recognized by drivers, businesses, the department and citizens alike. The resulting squad consisted of officers on foot, bicycle, horseback and motorcycle. 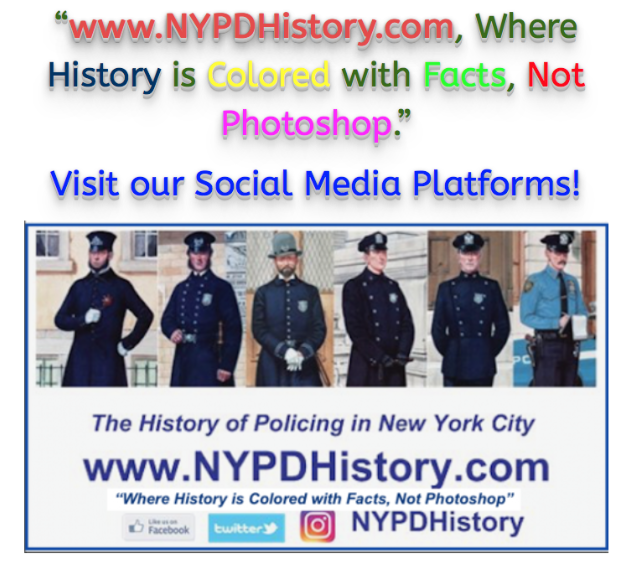 May 6, 1905, the day that the Annual Police Parade was held, the cornerstone for the new headquarters was laid at the corner of Centre and Broome Streets. Immediately after the ceremony, the Merchants Association of New York presented the “Traffic Squad” with a set of flags in appreciation for their efforts and results. The set of flags was beautifully designed. One contained, in part, the “horse wheel” design (below). 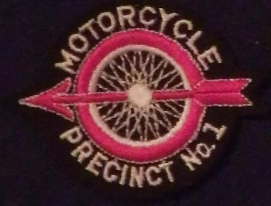 Apparently advancing the design of the wheel-horse for motorized vehicles such as motorcycles, the arrow-wheel emblem was adopted by NYPD Motorcycle Squad officers around 1923-4. 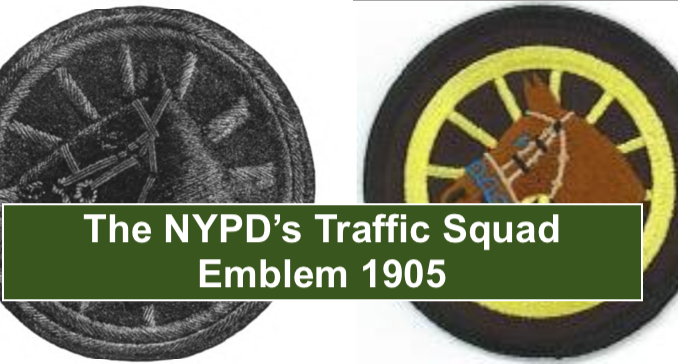 It appears that the NYPD was the first to adopt the “wheel-horse” design sleeve emblem (shoulder patch) in April 1904, and that the “wheel-arrow” design emblem used widely by motorcycle “wheel” units followed suit using the former as the basis for its design. Postscript: If anyone has any information to add to, correct, or update this article, please contact the author at the email address below.